Blogging is one of the only truly “free” start-up business models on the internet. You can quickly and easily sign-up for an account with a free blog service such as Goggle’s Blogger. From there you can add AdSense and other affiliate links to your blog and make money from your visitors clicking on those links. This is referred to as monetizing a blog – making money with a blog. You can accomplish all of this without ever spending a single cent of your own money. Google started a program called AdSense. AdSense is for website owners to make money by hosting other business’s advertisements on their websites. These AdSense ads can also be hosted on a blog, even if it is hosted by a free blog service. Google owns both Blogger and AdSense so they are both programmed to be very simple for anyone to use. Because Google owns both Blogger and AdSense they go extremely well together. With AdSense you paste the code the program generates for you into your Blogger template. Where the advertisements will show up on your blog depends entirely on where you choose to paste the AdSense code into your template. Later in this eBook we will talk about how to generate AdSense code and exactly where in your blog template to paste that code is. 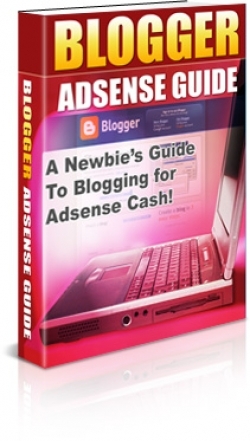 AdSense additionally allows you to blend in the ads with the content of your blog. This helps to make your AdSense ads look more like your written content and less like advertising billboards. 9 AdSense is also intuitive enough that it will serve you ads which match the topic and content on your blogs. For example, if you have a blog on saving money then AdSense will likely serve up ads for coupon clipping services, freebies online and other things which match your blog’s topic. On your saving money blog you will not see ads for irrelevant things like animal care or technology products. How do you make money with Google’s Adsense? Google pays you when the visitors to your blog click on the AdSense advertisements on your site. This is called “click through.” Google pays you a varied amount depending on the ad which was clicked on. * This deal is for an eBook. * You can download an eBook in PDF format from myorder page after a purchase. Preview Foreword All people are surrounded by a thought ... The All Important Big Picture.